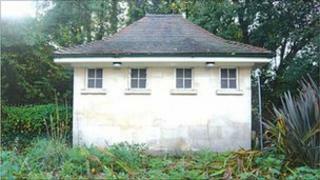 A former public toilet block in Bath, close to the city's cricket ground, is to be auctioned with a starting price of £20,000. Network Rail wants to sell the public convenience and 0.023 acres of surrounding land. The unusual property is described as a "stone-built single storey former public convenience arranged beneath a pitched tiled roof". The auctioneers say the site "may afford potential for redevelopment". They also point out the lavatories are built on a site that is "irregular shaped with frontage on to North Parade Road and Pulteney Road". The toilets go on sale on Thursday, 16 December in London.